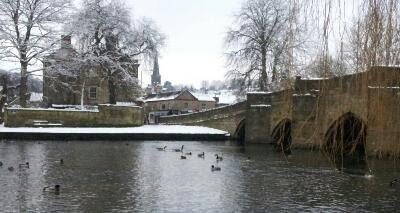 We nipped down to Bakewell today to take some snowy photos. Took photos of Bakewell along the river and the old bridge. Then stopped off in Ashford in the Water for shots of the church, river and Sheepwash Bridge (an old packhorse bridge). The was a good 3 inches everywhere, snow on tops of walls, covering trees. A good day for black and white photos. Sorry this one is in colour, it’s a mobile phone shot! Sun forecast tomorrow. Maybe do some more. Sorry can't see Bradford from here Chris! It was sunny here in Doncaster yesterday; I was thinking that it would be very pleasant in the Peak District.